Present state: Station demolished and the embankment on which the line had been carried removed. A health centre is located on part of the station site. Churchtown station was on the West Lancashire Railway (WLR) Company’s Southport & Preston Railway which opened in stages between 19 February 1878 and 6 September 1882. The WLR was promoted by Sir Thomas George Fermor-Hesketh, Bart. Royal Assent was given for the ‘West Lancashire Railway’ on 14 August 1871. The Act authorised construction capital amounting to £150,000. James Brunlees and Charles Douglas Fox were appointed as civil engineers, and the contract for construction was let to Clarke Pruchard and Co. The first sod was cut at a special ceremony held at Little London, in Southport, attended by the Mayor, Alderman Squire JP, on 18 April 1873. From the start the WLR project struggled financially and, although construction started successfully, it stopped abruptly when the contractor faced financial difficulties. A further WLR Act of 1875 authorised the raising of a further £187,500 and granted an extension of time for the line’s completion. A new contractor, Barnes & Squire, was appointed, and work resumed. platforms were provided. The main facilities were in a single-storey brick building east of the line, at street level. Ramps led up to the platforms which were timber-built. Each platform had an enclosed, pent-roofed timber waiting shed. Churchtown signal box was south-west of the road bridge on the down (Preston-bound) side of the line. There was no goods siding at Churchtown although, according to a WLR Board minute dated 20 February 1890, one was requested by a Mr Gregson. It was refused owing to the undeveloped condition of the roads in the area. At the time of opening Churchtown was served by trains between Hesketh Park and Hesketh Bank, but on 10 June 1878 the line was extended southwards to Southport Windsor Road. On 18 May 1882 the line was extended northwards to Longton Bridge, and it was completed to Preston on 6 September 1882. From this date trains started to run from Churchtown to Preston. To coincide with the completion of the route the WLR opened the new Southport Central terminus at the southern end of the line. On 1 July 1897 the Lancashire & Yorkshire Railway (LYR) took over the WLR. In 1900 they closed Churchtown signal box, which was replaced with levers on each platform. Station staff worked the levers which controlled home signals at the south-western end of the down platform and the north-eastern end of the up platform; the signals were to protect standing trains. directly for passenger traffic. The LYR decided to extend the electrification that it had planned between Liverpool Exchange and Southport Chapel Street through Churchtown and on to Crossens. The live rails reached Churchtown by 28 February 1904. 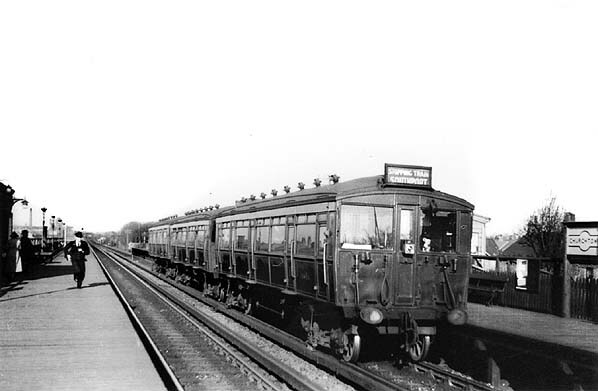 On 6 March an electric train was run though Churchtown from Crossens to Liverpool. A full public service began on 5 April 1904. Initially Churchtown was served by trains that ran non-stop between Liverpool and Southport and then called at all stations between Southport and Crossens. The station also still had its Preston services. Southport and Crossens. These were supplemented by 17 steam-hauled services that ran from Preston. There were 16 trains to Preston and one that was advertised as travelling ‘onward to the East Lancashire District’. The first departure from Churchtown was for Preston at 5:56 am. The last was for Southport at 11:16pm. In the LMS period electric lighting was installed at the station on iron standards. Southport and Preston. On Bank Holidays additional electric services were provided. 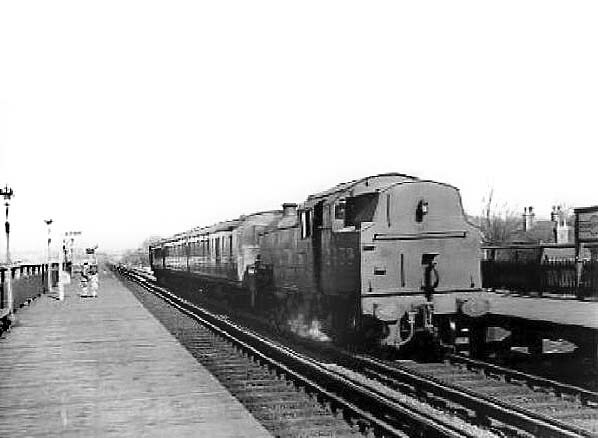 In winter 1956/7 Churchtown station had 20 weekday services to Preston, two to Accrington, 38 to Crossens and 59 to Southport Chapel Street; 34 of the Southport services were electrics that had originated at Crossens. Electric trains to and from Southport ran via Meols Cop, where they reversed. Churchtown’s signage was modernised after 1956 when LMR totem signs and complementary running-in name boards were installed. protest all services between Meols Cop and Preston were withdrawn with effect from 7 September 1964, and Churchtown station closed completely. On the same day the down line through the station was closed between Hesketh Park and Whitehouse West Junction Preston, and the up line closed between Penwortham ground frame and Hesketh Park. However, initially both lines were retained for track-lifting trains, worked as sidings. 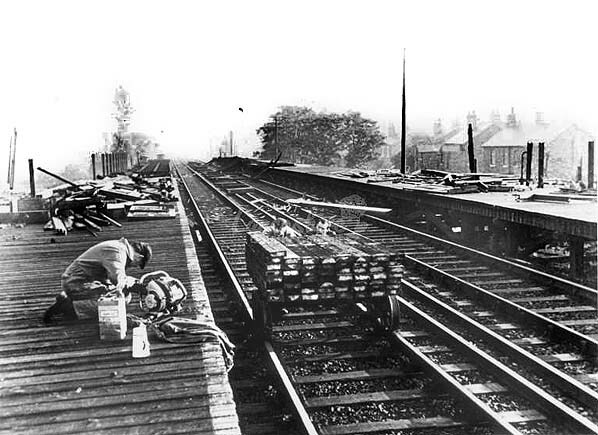 The platforms and platform-level buildings were demolished in January 1965.
carried the line over Cambridge Road was lifted off its abutments by a crane and taken away for possible re-use elsewhere as it was not very old, having replaced the original structure. The street level station building was demolished after 1967, and the embankment that carried the line through Churchtown was removed in stages after that date. A health centre was later built on the station site. 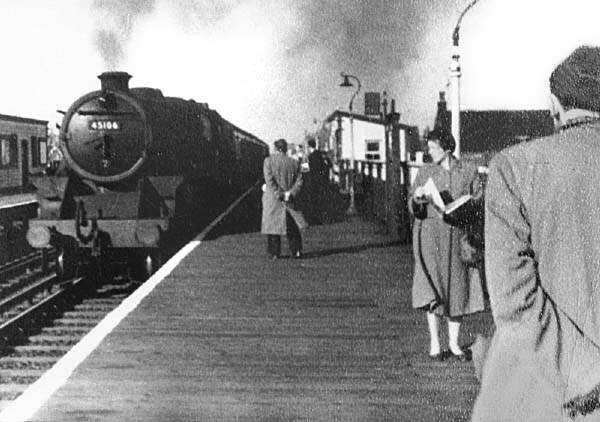 Click here for a colour film showing an EMU running between Southport and Crossens in 1964. Tickets from Michael Stewart except 2089 Alan Castle, route map drawn by Alan Young, Bradshaw from Nick Catford. 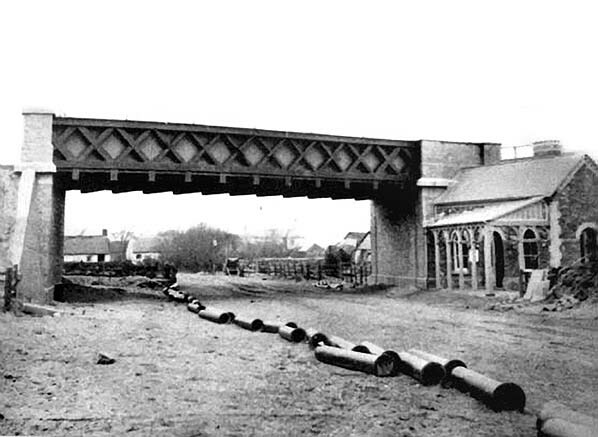 Churchtown station seen during the construction of Cambridge Road in the late 19th century. The station’s street-level booking office can be seen to the right of the picture. Churchtown station on an 1890 OS Southport town plan. The map shows how the booking office was at street level and the platforms were on an embankment. Note also the tramway passing directly in front of the station; trams provided direct competition with the WLR. 1894 1:2,500 OS map shows that Churchtown station had good revenue potential, as even by this date the area was becoming built up. A Crossens to Southport Chapel Street EMU of LYR vintage arrives at Churchtown station on 17 April 1939. The EMU was of a type built to operate on through services between the Liverpool - Southport line and the Liverpool Overhead Railway. This service was short-lived and the EMUs found their way onto Southport and Crossens services. A railway employee can be seen racing along the down (Preston-bound) platform, presumably in an attempt to reach the station exit in time to collect tickets from any alighting passengers. Looking south-west along Churchtown station's down (Preston-direction) platform in the early 1960s. 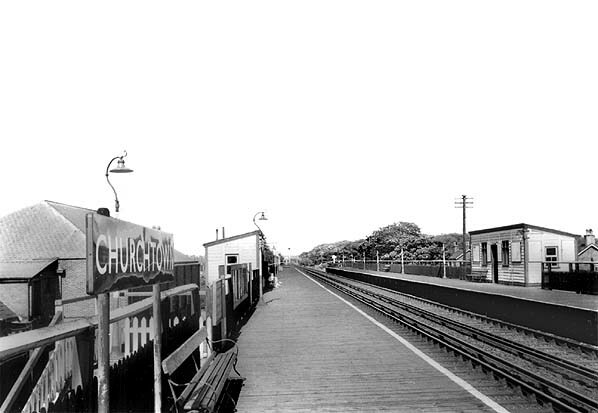 The picture suggests that Churchtown was a well-used local station. The train arriving would have been en-route to Preston from Southport Chapel Street. 45106 was built in 1935 by the Vulcan Foundry for the LMS. It had a working life of over 31 years being withdrawn from 12A, Carlisle Kingmoor shed in January 1967, and cut up by Campbells of Airdrie in May of that year. Looking north-east at Churchtown station from the west end of the down (Preston-direction) platform in 1963. The station’s timber platforms and waiting shelters are clearly shown. Despite being a busy commuter facility on an electrified line the station was to close the following year. 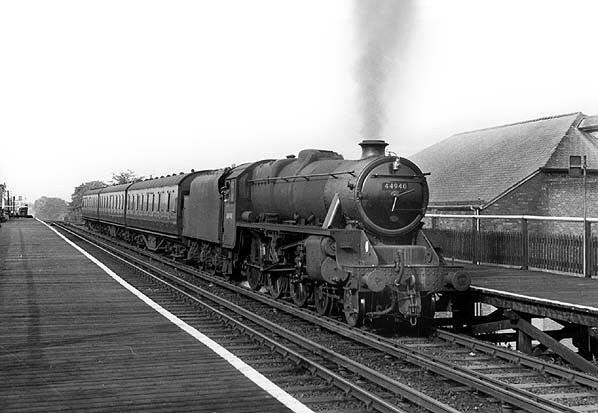 The 09:30 Southport to Preston service hauled by ex-LMS Class 5MT (Black 5) locomotive number 44940 arrives at Churchtown station in August 1964. The station was on an embankment and was provided with wooden, rather than masonry, platforms to keep their weight to a minimum. This picture was taken from the up (Southport-bound) platform. Three coaches make an easy load for this Black Five, and it looks as if all is well in the cab, with the fireman taking it easy! 44940 was one of a batch of 14 Black Fives built at Horwich works and entered service in November 1946 at 26A, Newton Heath shed numbered 4940. After spells at 24B, Rose Grove and 10C, Fleetwood sheds, it moved to 9B, Stockport Edgeley shed in February 1966, from where it was withdrawn in March, 1968 and scrapped at Drapers of Hull in August of the same year. Looking north-east along the down (Preston-bound) platform at Churchtown station in late 1964 or early 1965. Demolition of the station's platforms was underway. 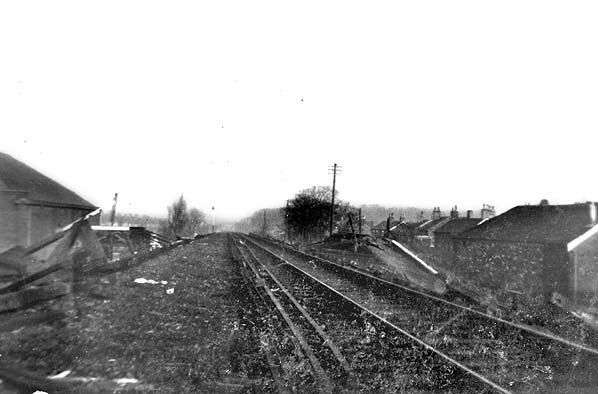 Churchtown station looking north-east on 31 January 1965. Demolition of the platforms was almost complete and the down line had been lifted. 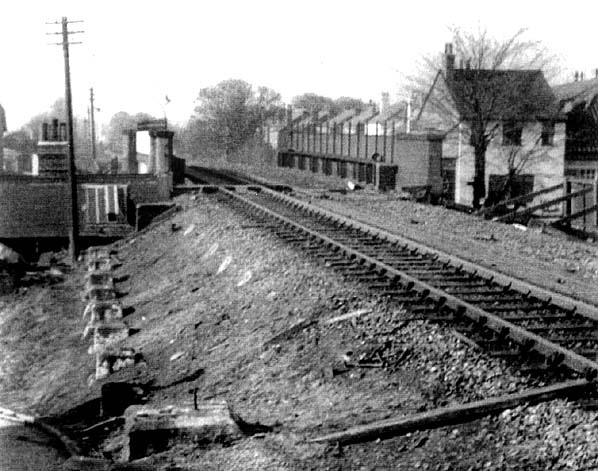 The south-west- end of Churchtown station in March 1965. The timber platforms had been removed leaving only the stone supports as evidence that there had been a platform at this location. To the left of the picture the footpath led down to the station’s street-level building, the rear of which is visible adjacent to the bridge. 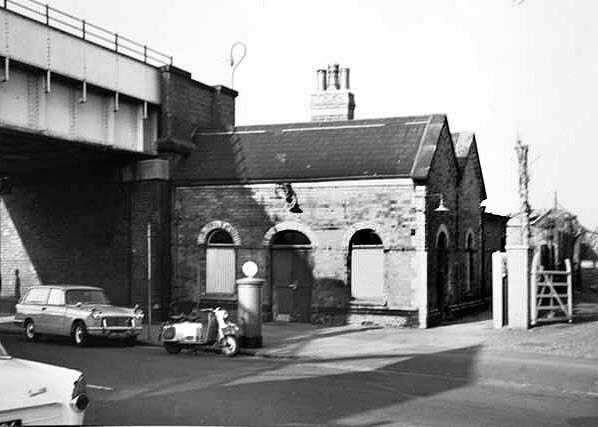 Churchtown station building on Cambridge Road in March 1965. 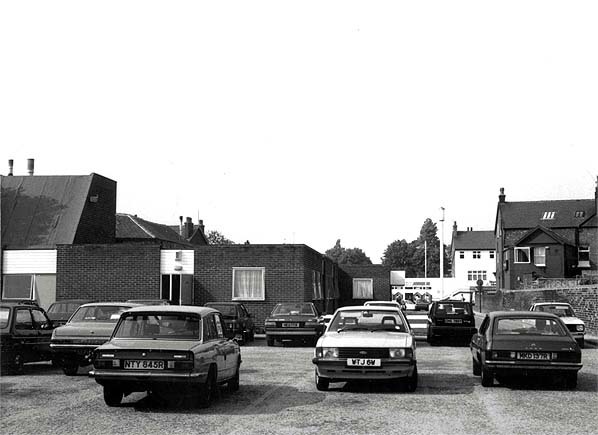 The site of Churchtown station looking south-west in August 1984. The picture was taken from a point that would have been towards the north-eastern end of the station. The embankment which carried the line through Churchtown had been completely swept away. 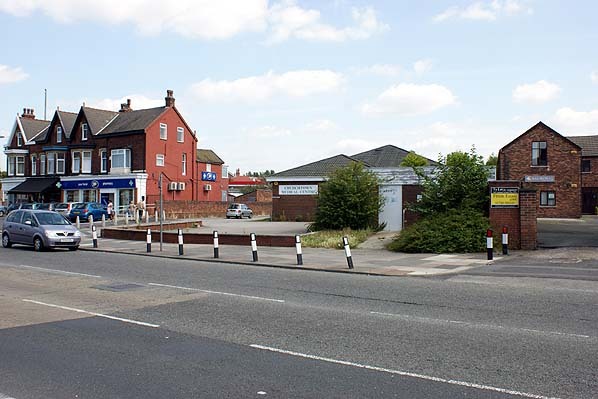 Looking north-east at the site of Churchtown station in July 2011. The station booking office had been to the left of the yellow and black sign. The station platforms had been above street level on an embankment. 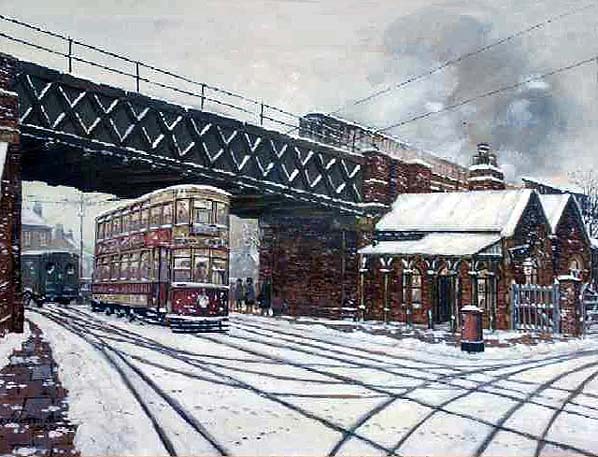 An artist’s impression of how Cambridge Road and Churchtown station might have looked on a winter's day in 1928.